Hidden no more, 1796 art creation finds new canvas. This was the art in the days prior to Thursday unveiling. 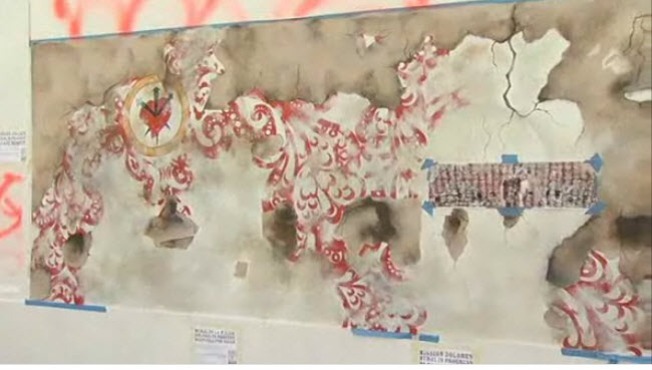 There was a special unveiling Thursday of a artistic re-creation of a 200-year-old mural discovered in 2004 that was hidden inside Mission Dolores Church in San Francisco. The new creation is now set up at an outdoor community market in San Francisco's Mission District. The original work was created in the late 1700s inside the church, but at some point it was covered by an altar. The new painting was painstakingly redone by Jet Martinez, Bunnie Reiss and Ezra Eismont who used photographs taken of the original work. Below is video that shows what it took to make Thursday's unveiling a reality.